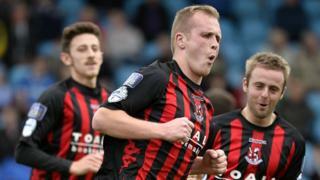 Premiership champions Crusaders moved to within two points of pacesetters Linfield with a 4-2 victory over Ballymena United. Paul Heatley, Jordan Owens, Gavin Whyte and Jordan Forsythe were on target for the Belfast visitors while Allan Jenkins and Gary Thompson netted for United. Sky Blues striker Matthew Tipton missed a penalty when the score was 1-1.